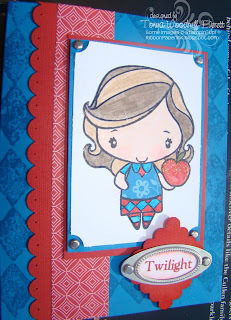 Ribbon ~ Paper ~ Ink: Twilight inspired cards! Hello, long time no post. I am so sorry!! Between flu season around my house and everyday hoopla I've been immersed in too many other things to even get a moment to sit and stamp! Wow, I've missed it and I've missed hearing comments from some new online friends. I recently devoured the Twilight book series. I loved them!!! Really, truly loved them. My fabulous friend and I were supposed to read them together but that didn't work out exactly but she read them also and loved them almost as much as I did. Thank you Kelley for becoming as obsessed as I am in Twilight and the upcoming movie!!!! Anyway, Kelley entered a Twilight fan contest to be part of an MTV audience of a Twilight special taping and participate in a Q & A session with the two main actors and the director, Catherine Hardwicke!! YAH....huge applause she got picked!!! So in true fan nature, I designed shirts and had them made for us to wear and on to the stamping part....I borrowed a couple images so that I could make cards to give to Rob and Kristen, the two main actors!!!! So I wanted to share them with you. 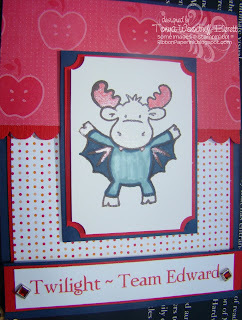 I loved them and they are truly my favorite cards I've ever made!! The Riley Vampire sparkles just like Edward does in the book and soon to be movie and I thought that Marie's Pink Poison Teacher Anya made a perfect Bella card!! I was able to give the cards to Larry Carroll of MTV and he promised to give them to the actors!! Isn't that exciting. THANK YOU LARRY!!! The whole event was amazing and though it was completely different than we thought...it was beyond fabulous!!! I met so many fans of Twilight and chatted all day with them. NINE of the cast members came to the taping and answered so many questions. I've never screamed so much in my life. LOL!! I am still on a starstruck high from meeting Taylor Lautner and Jackson Rathbone. It was a night I will not forget!!! No cameras or video equipment were allowed to be brought in so I have nothing else to show you but I have some great memories of a fabulous day and night! I had SO much fun. I'm so glad you were able to go with me, Tonya. It was a blast. I'll never forget it. I just wish I would have been able to talk to my boyfriend, Rob. Well, maybe Monday at the premier! Wish you could come. Great cards! You should email Larry to see if he was able to give them to them. I have his email. I bet you had a blast! I love the Riley card! I have got to get some of those stamps soon. Both of these cards are wonderful. I had to go online and order the Bella image. I know it really isn't Bella-but, I love the interpretation. Thank you for sharing your Twilight experience. That is so awesome! I love the Twilight Series...can't wait for the movie. Big Twilight fans here in my house! love your cards and how great is it that you got to meet some of the cast from the movie and other fans! Totally awesome! I loved the Twilight book series also and read them one after the other... then someone mentioned the Southern Vampire Series by Charlenne Harris - give those a read - they are even better!!! Wow, Twilight is so big right now. What a fun trip. These cards are great, thanks for sharing. The cards are terrific. Glad you had such a wonderful time!